The genetic code specifies the amino acids that are assembled to make polypeptides. The way that DNA codes for polypeptides is central to our understanding of how cells and organisms function. A polypeptide is coded for by a gene and that a gene is a sequence of nucleotides that forms part of a DNA molecule. The sequence of bases in a DNA molecule is a code that determines the sequence in which amino acids are linked together when making a protein molecule. A sequence of DNA nucleotldes that codes for 1 polypeptide, or for 1protein, is known as a gene. The sequence of amino acids in a protein - its primary structure determines its 3-dimensional shape and therefore its properties and functions. For example, the primary structure of an enzyme determines the shape of its active site, and therefore the substrate with which it can bind. There are 20 amino acids. Because there are 4 bases, there are 43 - 64 different possible combinations of bases in a triplet. Some amino acids therefore are coded for by more than 1 triplet. For example, the triplets AAA and AAG both code for the amino acid phenylalanine. The code is therefore said to be degenerate. 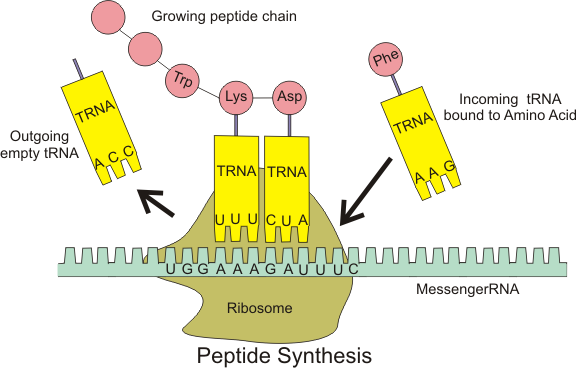 Proteins are made on the ribosomes in the cytoplasm, by linking together amino acids through peptide bonds. The sequence in which the amino acids are linked is determined by the sequence of bases on a length of DNA in the nucleus. The first step in protein synthesis is the transcription of messenger RNA (mRNA) from a DNA gene in the nucleus. 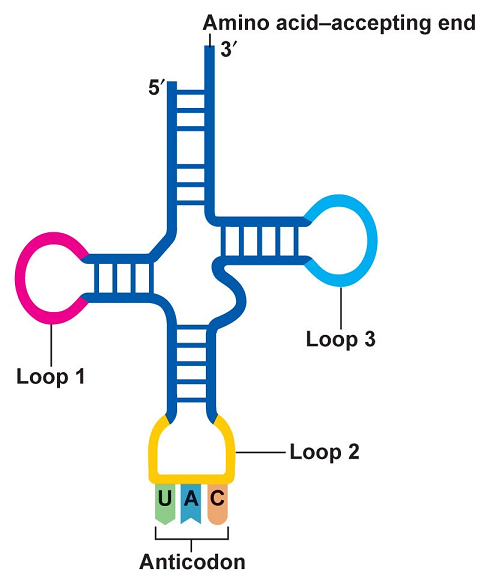 In the nucleus, the double helix of the DNA is unzipped, exposing the bases on each strand. There are 4 types of free RNA nucleotides in the nucleus, with the bases A, C,G and U. The RNA nucleotides form H bonds with the exposed bases on the template strand of the DNA. As the RNA nucleotides slot into place next to their complementary bases on the DNA, the enzyme RNA polymerase links them together (through their sugar and phosphate groups) to form a long chain of RNA nucleotides. This is an mRNA molecule. It contains a complementary copy of the base sequence on the template strand of part of a DNA molecule. 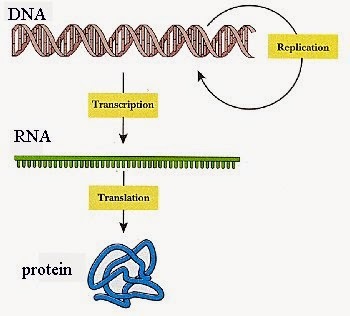 If the DNA coded for tRNA and rRNA, then the transcript is cut and the tRNA and rRNA are released. If the DNA codes for protein, then the information carried in the sequence of RNA (mRNA) must be translated into a sequence of amino acids. Because we are changing “languages”, moving from a language of nucleotides to a language of amino acids, this process is called translation. - ribosome (a writing desk, a place to do the work). The mRNA molecule breaks away from the DNA, and moves out of the nucleus into the cytoplasm. In the cytoplasm, 20 different types of amino acids are present. There are also many different types of transfer RNA (tRNA) molecules. Each tRNA molecule is made up of a single strand of RNA nucleotides, twisted round on itself to form a clover-leaf shape. There is a group of 3 exposed bases, called an anticodon. There is also a position at which a particular amino acid can be loaded by a specific enzyme. tRNA becomes attached to a ribosome. Triplets of nucleotides (codons) on the mRNA molecule fit into the anticodons of transfer RNA molecules that carry amino acids around inside the cell. The amino acid that can be loaded onto the tRNA is determined by the base sequence of its anticodon. For example, a tRNA whose anticodon is UAC will be loaded with the amino acid methionine. A tRNA molecule with the complementary anticodon to the first codon on the mRNA, and carrying its appropriate amino acid, slots into place next to it in the ribosome, and hydrogen bonds form between the bases. Then a second tRNA does the same with the next mRNA codon. Two codons fit into a groove in the ribosome. The first codon is generally AUG, which is known as a start codon. It codes for the amino acid methionine. The amino acids carried by the two adjacent tRNAs are then linked by a peptide bond. 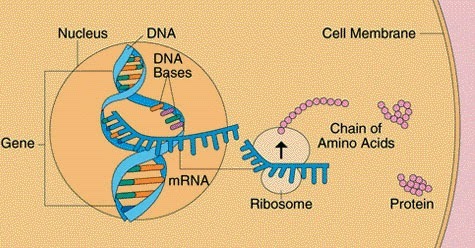 The mRNA is then moved along one place in the ribosome, and a third tRNA slots into place against the next mRNA codon. A third amino acid is added to the chain. The ribosomes combine the amino acids to form the finished protein. 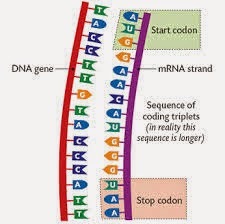 This continues until a stop codon is reached on the mRNA. This is a codon that does not code for an amino acid, such as UGA. The polypeptide (long chain of amino acids) that has been formed breaks away. 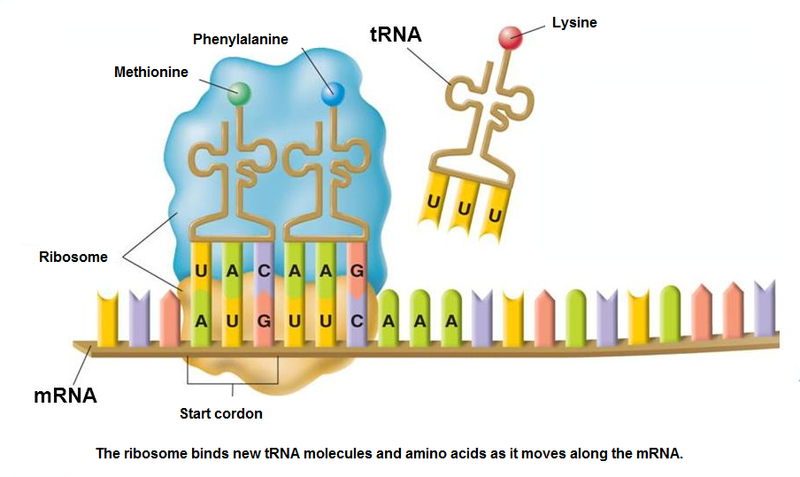 This process of building a chain of amino acids following the code on an mRNA molecule is called translation. DNA codes for polypeptides is central to our understanding of how cells and organisms function.